The basic principles for preparing the balance sheet of non-trading concerns are same as of trading concerns. The balance sheet of non-trading concerns may be prepared either in the order of permanence or in the order of liquidity. Some specific items that usually become the part of the balance sheet of non-profit organizations have been discussed here. Notice that the sample balance sheet of non-trading concerns given above is similar to that of trading concerns with the exception of capital fund in place of owner’s capital or owner’s equity. 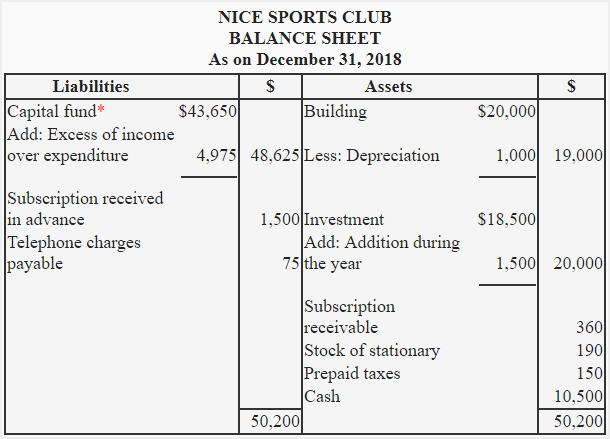 This sample only presents the format and does not depict the complete list of items that should appear on the balance sheet of a non trading concern. 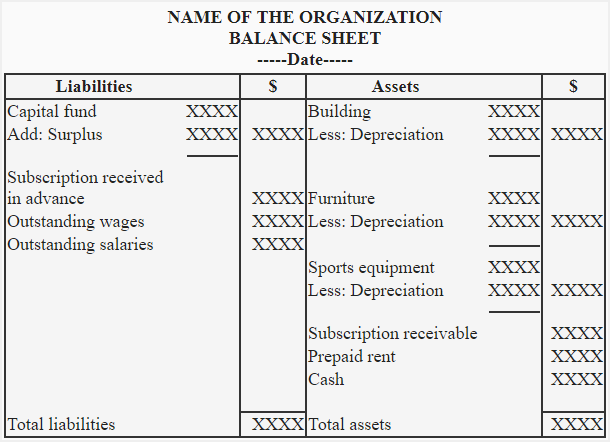 The items appearing on an actual balance sheet of a non-trading concern may be more or less than the items in above sample. 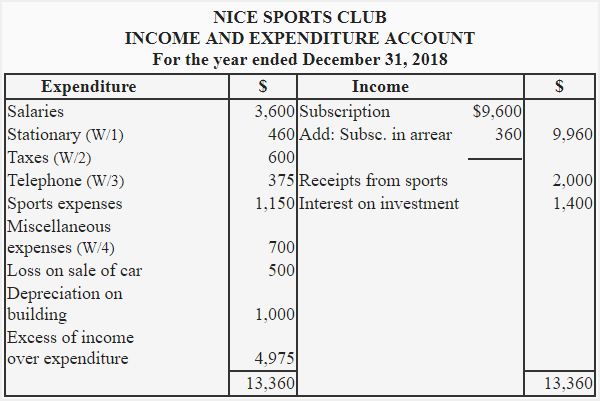 Subscription amounting to $360 was outstanding on December 31, 2018. The taxes for the first three months of the year 2019 were paid in advance. The telephone expenses amounting to $75 were outstanding on December 31, 2018. 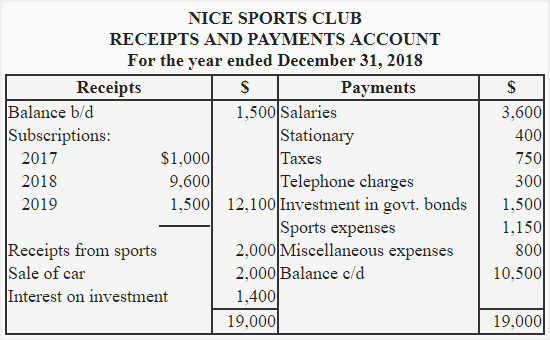 The miscellaneous expenses amounting to $100 were outstanding on December 31, 2017. The value of investment was $18,500 on December 31, 2017. The stock of stationary was $250 on December 31, 2017 and $190 on December 31, 2018. On December 31, 2017, the book value of building and motor car was $20,000 and $2,500 respectively. The depreciation @ 5% is to be provided on the book value of the building. The club sold its car at a loss of $500 during the year. No depreciation is to be provided on car. Required: Using above information, prepare an income and expenditure account for the year ended 2018 and a balance sheet as on December 31, 2018. The taxes have been paid for fifteen months ( i.e., for current year as well as for first three months of the next year).